It is the colour of Dorothy’s shimmering shoes, Ariel’s hair and the one that makes for a high impact outfit on most brunettes … that’s right, the colour is red. Anyway I am getting off track. 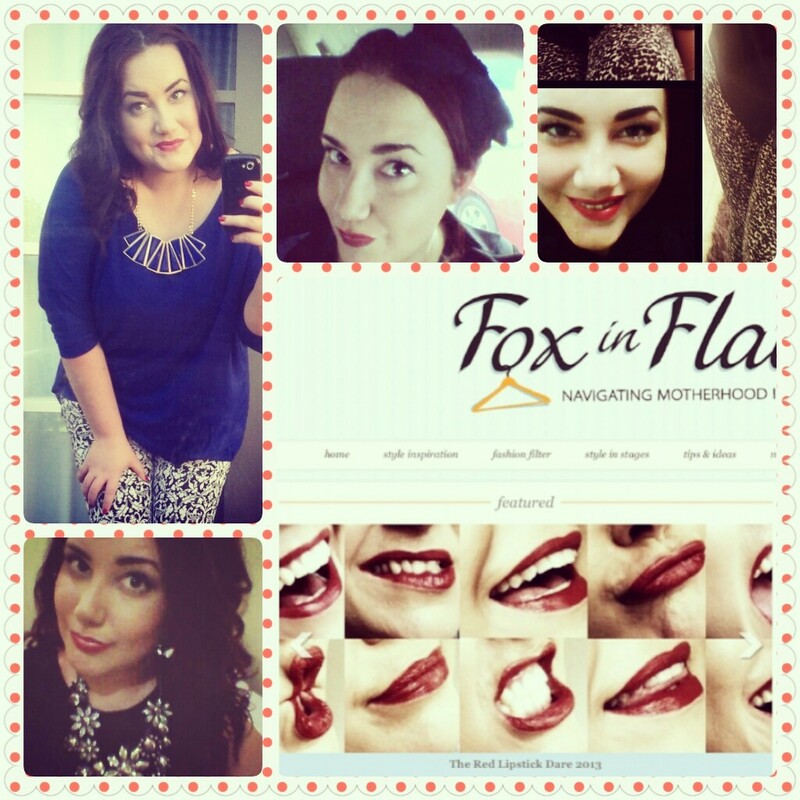 Foxy-lady, style dare extraordinaire Andrea from Fox in Flats announced last week that this week her Style Dares were starting up again and it is been kicked off with a bang! The Red Lipstick Dare is a dare to wear red lipstick every day, for one week. I love these kind of dares as it forces you out of your comfort zones and in this case, takes something that many women would consider an evening or formal occasion look to the brightness of day. I have taken part in Andrea’s month long dares previously and attempted a 7 day hair one but I had never taken the red lips dare. The past year or so I have been loving red lipstick and have worn it often – so I jumped at this dare. 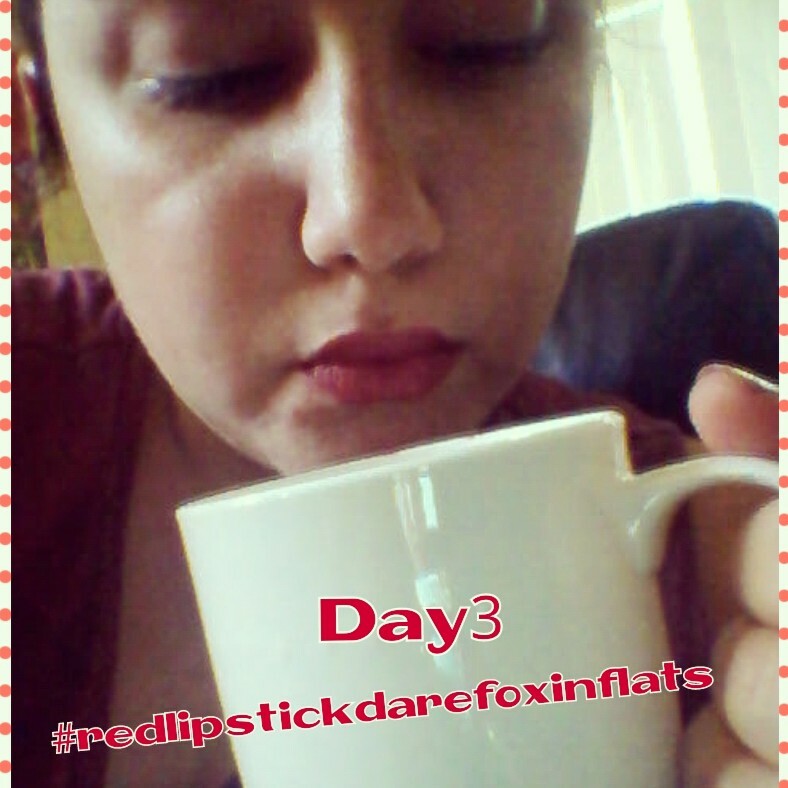 Click the link above for more information on the dare + A’s great tips at making red lips last! I am house-sitting currently and was surprised to find that I had many of my red products, a couple I had purchased recently to try and one had arrived in a prize pack I won. 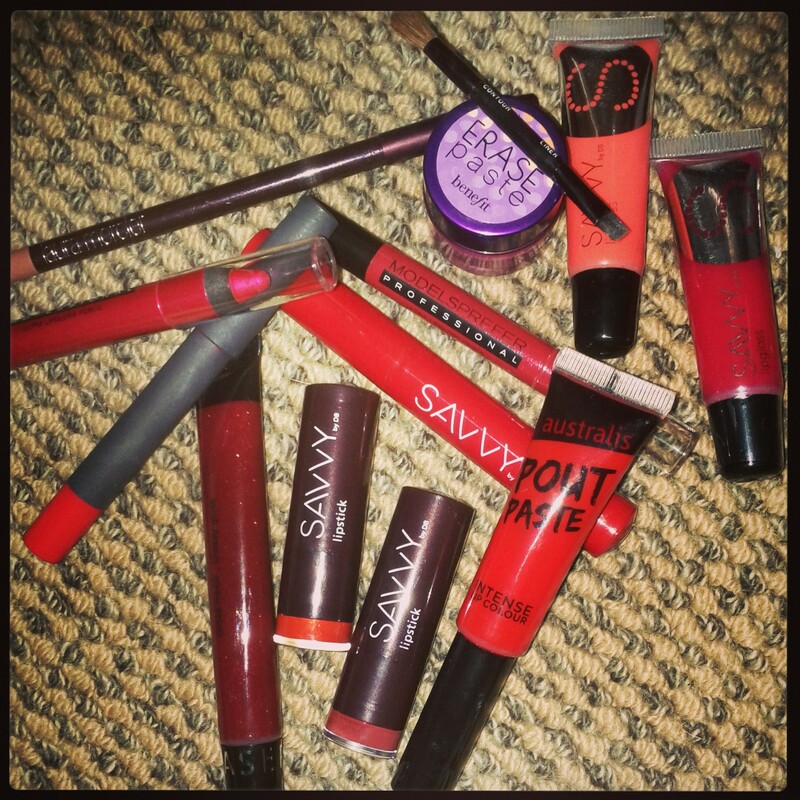 I am without my trusty Smashbox red lippie, but I have enough for 7 days – different product each day. The main brands I am using are Savvy, Ultra3, Models Prefer and Bite Beauty. I have been sick, and despite not feeling like going out and been told by my GP to do nothing but rest, drink fluids and watch movies I have stayed determined to complete this dare. So I have. No makeup, hair unwashed and red lips and it has lifted my spirits definitely… as Elizabeth Taylor famously stated, “Pour yourself a drink, put on some lipstick and pull yourself together…” well Liz I’ve tried, water or Mum’s cure all lemon-honey-vinegar drink in hand, red lips and a blanket on the lounge. Three days down, four to go! Hopefully I can kick this sick business to the curb and actually take some good pictures where I am not trying to hide my face! It is good to know though, that even in my pjs, red lips still feels Glam! Also, it is not too late to join. 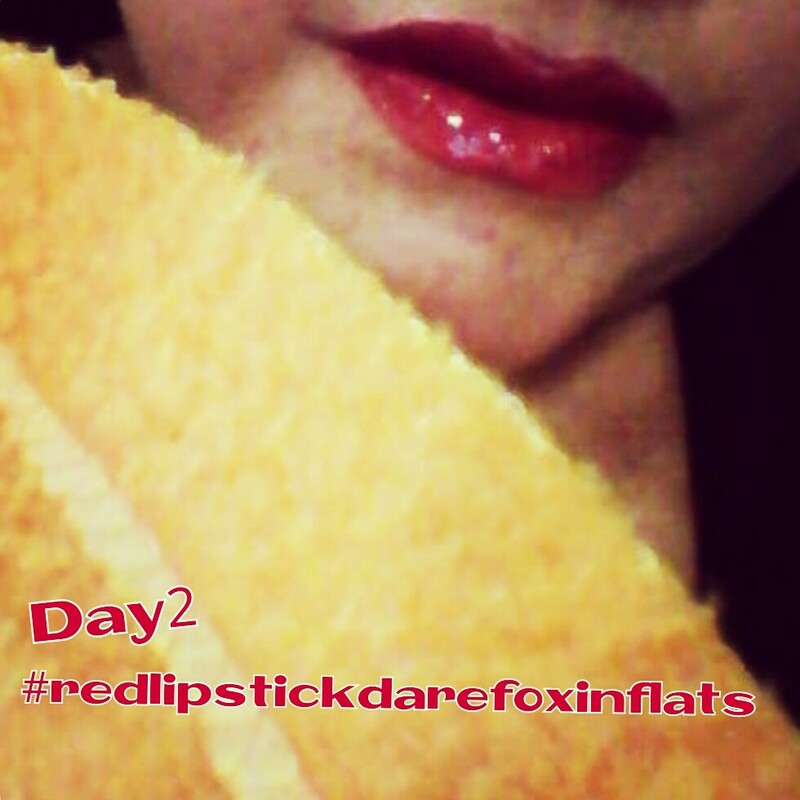 You don’t have to complete the same 7 days as me – you can start the 7 Day Red Lipstick Dare at any time, to complete it you just need to have red lips for a week straight.. I’d love to hear if you are playing along so I can look out for your pics or posts! 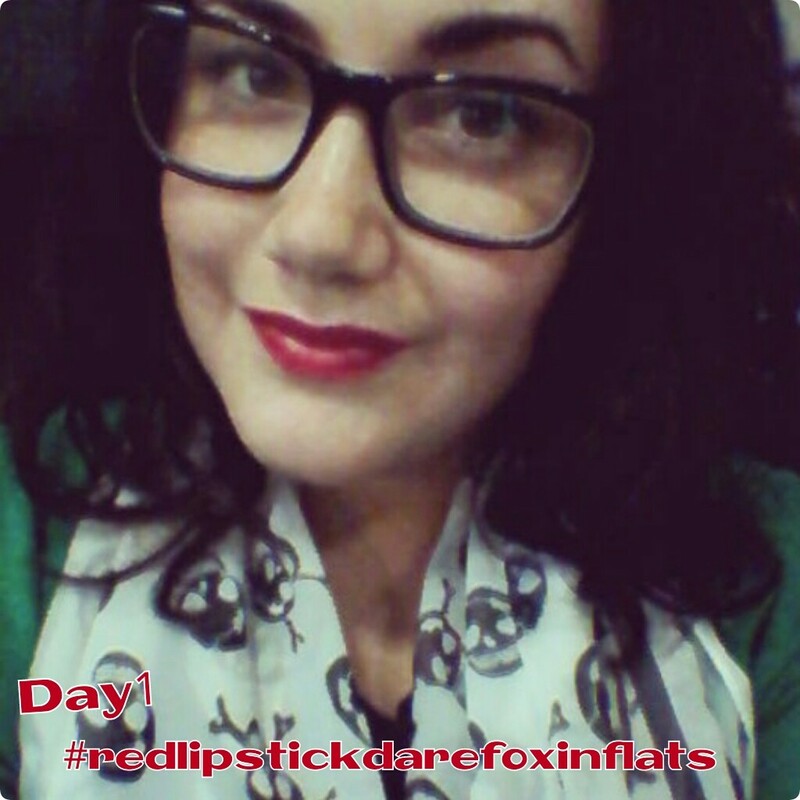 All you have to do is upload your shots and use the #redlipstickdarefoxinflats on instagram or twitter.